Thankfully bad behaviour is a less common reason for relinquishment with just 7% of cat owners and 14% of dog owners stating behaviour was the reason they surrendered their pet. However, at Australian Pet Welfare Foundation, we don’t JUST want to stop pets being admitted to pounds. We want owners and pets to thrive. Poor behaviour can be stressful for many pet owners. Seek help early if your pet has a behaviour problem. Resolving behaviour problems quickly decreases the number of pets surrendered to pounds, and increases the life enjoyment of many more! Pets are not born bad. Dogs and cats are influenced by their surroundings, as well as their interactions with others. 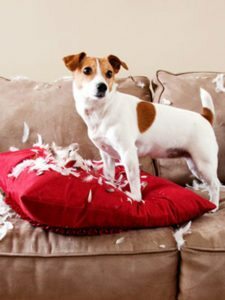 In fact, without realizing the reasons behind your pet’s unwanted behaviour, you may be accidentally reinforcing bad pet behaviours. Relinquishment to shelter is a last resort for solving your pet’s behaviour problem. With patience and time, resolving behaviour problems together, you and your pet can work through most unwanted behaviours that may arise. Click below for help interpreting your dog’s and cat’s behaviour, and trouble-shoot the undesirable behaviours.